The Azure Executive Apartments Sydney offer 3.5 star contemporary budget studio and 1 bedroom self contained apartments - optimum security and comfort in the heart of tranquil Potts Point, adjacent to some of Sydney's trendiest cafes and finest restaurants and a short walk to the Sydney CBD. 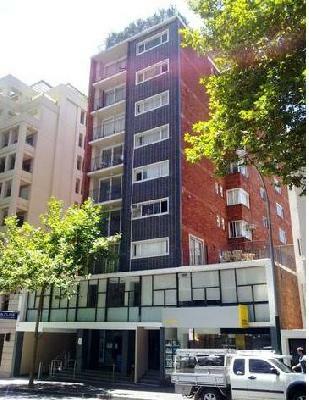 The Azure Executive Apartments are situated in Macleay St, Potts Point, twenty minutes by taxi from Sydney International Airport, and five minutes by taxi or a short walk to the Sydney Opera House and the Sydney's Business Centre. All types of travellers can take advantage of the discount accommodation at the Azure Apartments Sydney, as well as the range of modern amenities including direct internet access, faxing facilities, guest laundry, lift, airport shuttle, security, baby cots available and express check in/out. Facilities include on-site security parking - fee applies, guest laundry, airport shuttle, security cameras, wheelchair accessibility, express check in/check out, cot hire and lift/elevator. Business clients are also well catered for at the Azure Apartments with high speed wireless internet connection, facsimile facilities and photocopy service. The Azure Executive Apartments Sydney offer ideal central Sydney apartments accommodation at affordable rates for business and leisure travellers. . Nearby Attractions : Regarded by many architects as one of Sydney's most impressive concentrations of 1920s/1930s buildings, Macleay Street and surrounding areas have many bricks-and-mortar treasures. Down the road from Kings Cross, Sydney's infamous red light and nightclub district, the area became home during the 1920's to a culture of Bohemian lifestyle, writers, artists and the like. Studios, art galleries, live theatre and strip shows became the new way of life. The post war years attracted many overseas immigrants to Australia. Sydney became a large cosmopolitan mix of Europeans and Asians resulting in its diverse, multicultural society of today. Soldiers and troops flocked to Kings Cross for relaxation and partying after the Vietnam War years and flats, boarding houses and accommodation sprang up over the years to cater for the increasing population. Today Kings Cross is one of Sydney's premier 24 hour entertainment precincts. Nightclubs, theatre, bars, restaurants, cafes, eateries, gaming, and strip shows sprinkle the cosmopolitan walkways of the area and for locals and visitors, it offers a myriad of colour, tastes, atmospheres, vibe and energy.